I’ll tell you what happened in a moment. In the meantime, let’s ponder a number. In a recent survey conducted by Alamo Rent a Car, only 43 percent of families said they planned their vacations more than five months in advance. So in other words, a majority of families don’t plan ahead, and some (like me) wait until the last minute. You don’t have to become a statistic. If you find the right travel planning partner, give yourself enough time, and avoid a few common planning pitfalls, you can avoid being that guy on the plane who is about to become homeless. 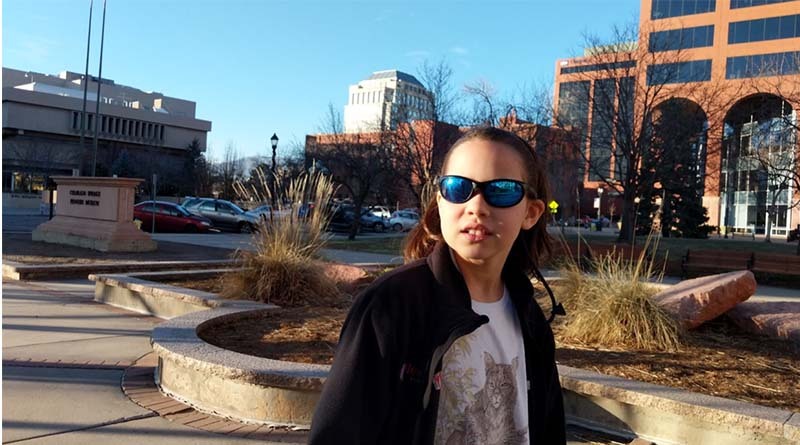 Erysse Elliott in downtown Colorado Springs. Back to my story. At the time of our flight to Denver, I was working with a travel agent, but our relationship was badly frayed. (I am a terrible client, so I take full responsibility.) Instead of booking accommodations in advance, I was left with no option but to search Airbnb on the day of our departure. A few days later, in a not completely unexpected move, she fired me. My kids and I ended up in a so-so rental with not much to do, and it took weeks before we had a grip on our itinerary. But I also learned an important thing: To plan a successful trip, you need a reliable travel planner. I’m not necessarily talking about a travel agent or a meeting planner. Sometimes your best travel planning partner is your spouse, your best friend, or one of your kids. It helps if your travel planner is someone who has a stake in the outcome. Travel agents have a financial stake, but they’re not on the trip with you unless you’re dating one. My oldest son, Aren, is a great travel planning partner. He knows what he wants and has learned a lot from the countless missteps we’ve made as a family. My middle son, Iden, is also a terrific planner, but at age 14 he will only help me if the outcome will affect him directly. For example, we’re planning a trip to Los Angeles at the moment. Iden, without any prompting, has staked out several apartment buildings in downtown LA where he wants to stay. I’m not sure if we’re going to rent there, but I appreciate the help all the same. I know one thing about myself now that I didn’t before. I need to be in control of my own itinerary. If I need to plan something exotic like a round-the-world cruise or a safari, then sure, I’ll call an agent. Otherwise, it’s just the kids and me. 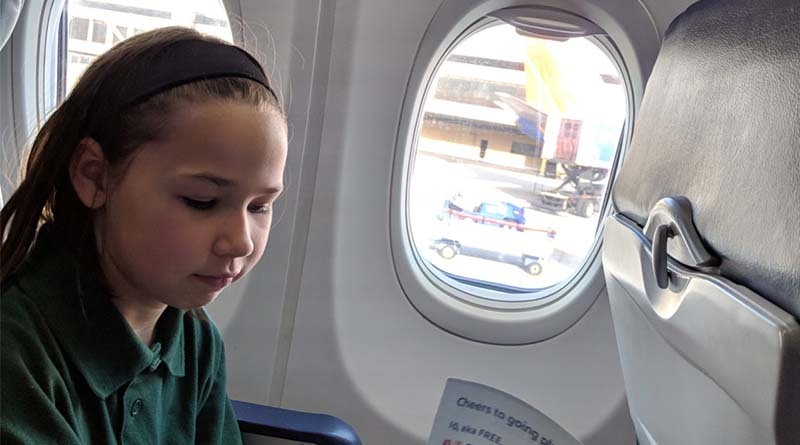 Erysse on a recent flight to Seattle. She helped plan this one. Another thing my Colorado misadventure taught me: don’t wait too long to make plans. I had asked my travel agent just after Thanksgiving about our accommodations. Then the holidays happened and suddenly it was the day of departure. That’s on me. I should have taken matters into my own hands. Now, planning for our LA trip, I’m afraid I’ve made the same mistake again. With just two weeks before our departure, we don’t have a place to stay. Why? Blame the holidays and a nasty cold virus that affected the two principal travel planners in my family. At the risk of repeating myself, here’s the takeaway: Give yourself at least a month before your arrival to book your accommodations. The same thing goes for airline tickets. If you wait until two weeks before your departure, options will be limited, the price will jump and the trip might become unaffordable. What happens if you wait too long? Well, as I write these words, I don’t have a place to stay for an upcoming trip to California. There’s a very real chance that I might have to find a place to stay out of town, or check into a hotel for part or all of my visit, or worst-case scenario, I might have to cancel my trip. Don’t be like me. Please. Besides finding a good planner and giving yourself plenty of time to plan, you can improve your planning skills with a few easy strategies that I’ve learned along the way. Get the whole family involved. If you have young kids, they might not be old enough to help you plan, but they will always share their opinion with you (at least mine will). Give them a sense of ownership in the trip. It will take you a long way. Calendars are your friend. An electronic calendar can help you visualize every flight, every car rental, every hotel room, every day trip. You can also easily share the information electronically with your travel companions. I like Google Calendar, but there are lots of alternatives, many of them free. Draft and distribute. When you’re done planning, create a draft of your trip and distribute it to all the members of your family for review. You might be surprised by the response. Often, a careful review of dates and times will reveal planning errors. You’ll have plenty of time to fix them, too. With a little planning and luck, we’ll never end up flying somewhere and then having to wing it on Airbnb. Or, I might have to learn my lesson again. Maybe the third time’s the charm.